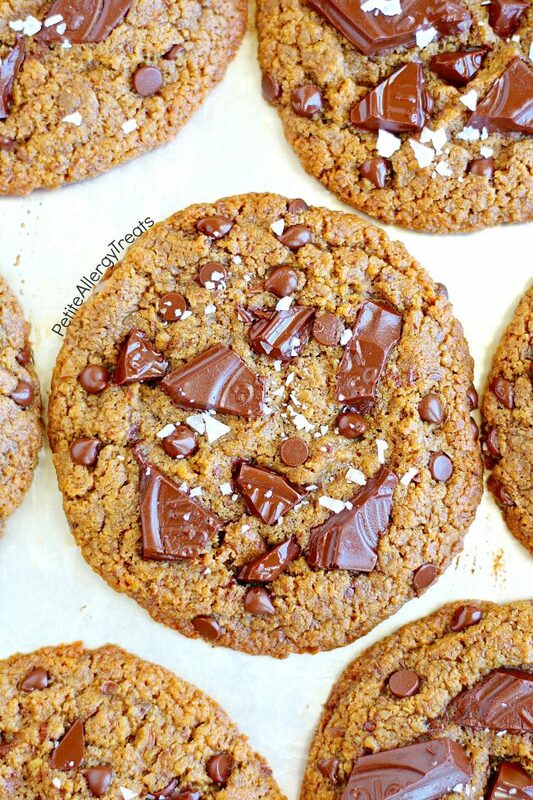 Bake up some Vegan Gluten Free Chocolate Chunk Protein Cookies for the next school treat! Delicious gluten free chocolate chunk cookies packed with protein and taste you’d expect from peanut butter but made completely peanut and tree nut free. Annd these chocolate chip cookies are dairy free, egg free, soy free, sesame free and Vegan making these cookies super food allergy friendly! Can you believe school started? I’m still a bit in denial. The early wake up. Packing lunches. Driving for drop off and pickup. Birthday treats. It’s the standard list of changes for school. And I would be ok with those. But this year is a whole new ball game. Yes, this year it’s DOUBLED. Mr. Naughty started school…He’s the one I worry about the most. Not that I don’t worry about my older peanut allergy son, I still do. It’s just the level of worry is over 100 fold due to multiple food allergies instead of just 1. The school year gets easier each year but more difficult at the same time. As I mentioned above, this is the first year with 2 kids in school. More daily work to keep the kiddos safe. And stress, let’s not forget daily stress. Over the years I’ve learned some ‘life hacks’ for food allergies to save myself time and energy . The easiest thing to help prepare for the week is to cook/bake/package things ONCE. That way it’s just grab-and-throw during the busy week. Yep. You read that correctly. I make lunch only once for the week. My school lunch system works pretty well most of the time. The hiccups happen with unannounced special days or last minute birthdays pop up at school. For these slightly frustrating days, I’ve already planned ahead. Or at least I’ve tried. At the beginning of each school year, I send a plastic container full of special safe treats to substitute unsafe treats shared at school. In the past, I would pack individual bags of cookies, wrapped in plastic wrap and a ziplock in hopes of keeping fresh as long as possible. I’d try to remember how long they’ve been there but you get busy… and forget. I don’t doubt they would be safe to eat, but not as fresh from the box. Better than having nothing for you child. You don’t want you child the only one sitting without a special treat, right? A secret that will change your food allergy ways of living. Are you ready? Individual pre-packaged Food Allergy Friendly Treats. Or Grab & Go Packs from Enjoy Life Foods. Now for those of you without multiple food allergies, you’re probably thinking–What’s the big deal? There must be plenty of ready made snacks out there. Truth be told, when you have more than 1 food allergy (or 15+ like us) convenient foods are eliminated as soon as we start reading the ingredient label. That’s why I wanted to tell you Enjoy Life Foods created smaller versions of our favorites snacks. Think about that for a moment. The same food allergy friendly snacks made on dedicated equipment and facilities free from the Top 8 Allergens… but for on-the-go-eating. Always fresh. Always ready. Always safe. Mind blown. And go figure they appropriately named them Grab & Go Packs! Food allergy life just got a little more convenient thanks to these lifesavers. Find the sweet varieties of gluten free egg free dairy free vegan, chocolate chip cookies, decadent bars, chewy bars and Choco Boom Chocolate Bars. If you’re looking for salty go for all the Plentils Chips. Want sweet and salty? The peanut/ tree nut free version of trail mixes, Beach Bash trail mix and Mountain Mambo are ready to go. There are countless possible combinations for lunches or special treats. Love and wish these were around years ago. So many safe options that look and taste great. While on the go-snacks rule, there’s something extra special about homemade food allergy friendly treats. Homemade takes more time but has a different type of love involved. You can taste the difference, right? But really. 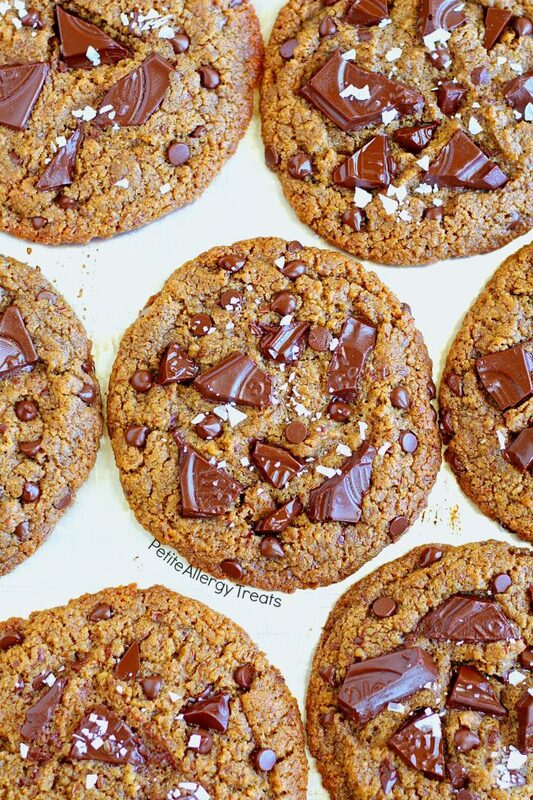 You’ve gotta try these vegan gluten free chocolate chunk protein cookies. They are just like bakery cookies if you sucked out all the wheat, eggs, dairy, nuts and soy. Big. Crisp on the outside. Chewy on the inside. Loaded with dairy free soy free chocolate chunks. I’ve always wanted bigger thicker chocolate chunks like the bakeries, so I took the Enjoy Life Dark Chocolate Choco Boom Bar and chopped them up. 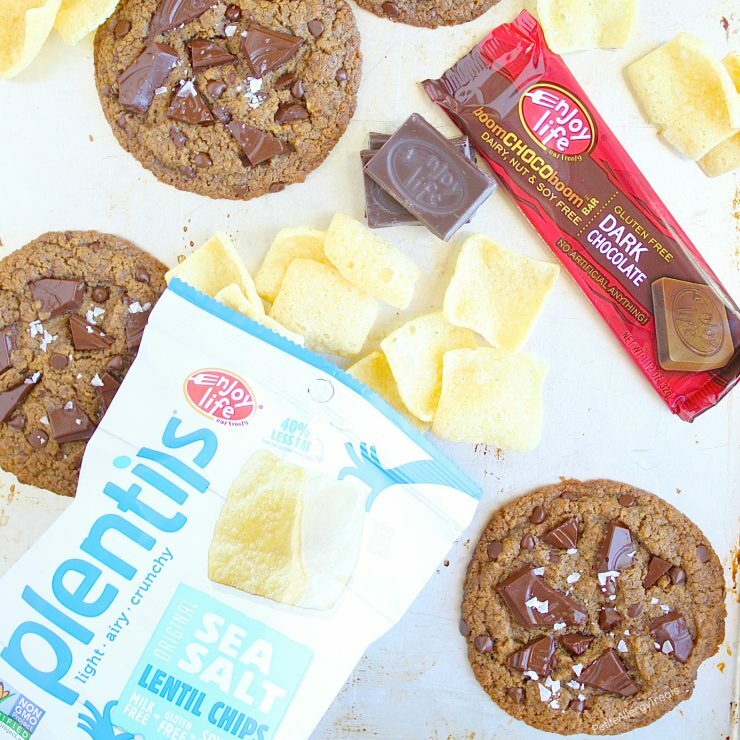 Sweet and salty have always been great together so then I had this idea to grab the Plentil Sea Salt chips and combine them with dark rich chocolate. Cookies are cookies, not often adding any nutritional value. Annd they’re the first thing to go in a kid’s lunch. So why not add some nutritional value with the protein kids need. 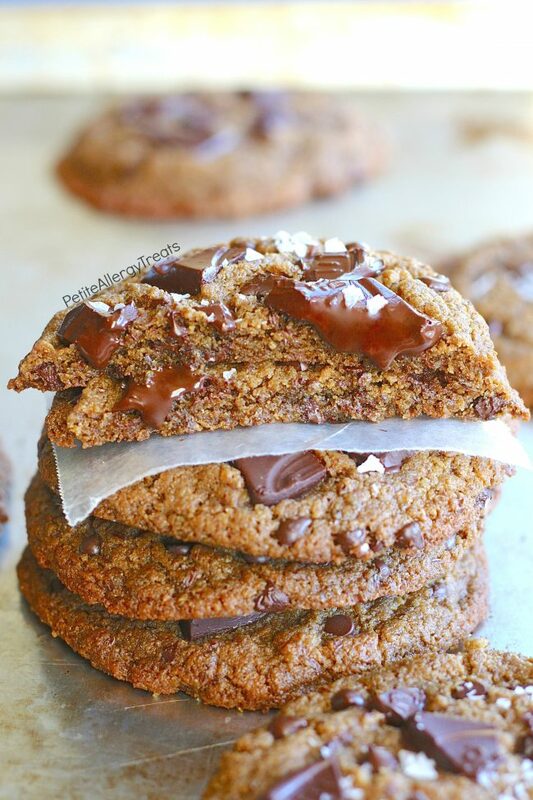 This recipe for gluten free chocolate chunk protein cookies are packed full of 44 grams of protein, or approximately 4 grams each. Yes, there is regular sugar used. Yes, chocolate is also added. Just like other sugary birthday treats non-allergy kids enjoy once in a while. You might be tempted to reduce some sugar or add extra seed butter (I often reduce sugars whenever possible). And you could in this recipe. But be fair warned…The amount of sugar and seed butter are in *perfect* balance to hold things together. Traditional wheat based peanut butter cookies tend to be a bit crumbly from the nature of the nut butter. Peanut butter soaks up all available moisture. This is what causes that dry your mouth out sticky paste to form in your mouth. Same deal with nut free seed butters. Since these cookies gluten free AND egg free, you’ll need all the binding help you can get. Go ahead and bake these for that special classroom treat to share or baking and freeze for when you need want one! Combine ground flaxseed and non-dairy milk. Mix until combined. Add sugar slowly and stir to dissolve. Place in refrigerator for 10-5 minutes until it thickens into a gel consistency. Pour flaxseed mixture into a large mixing bowl and add all remaining ingredients except seed butter and chocolates. Mix on high until fully incorporated, scraping down the sides of the bowl. Fold in mini chocolate chips and place dough refrigerator for 30 minutes or until easy to handle. 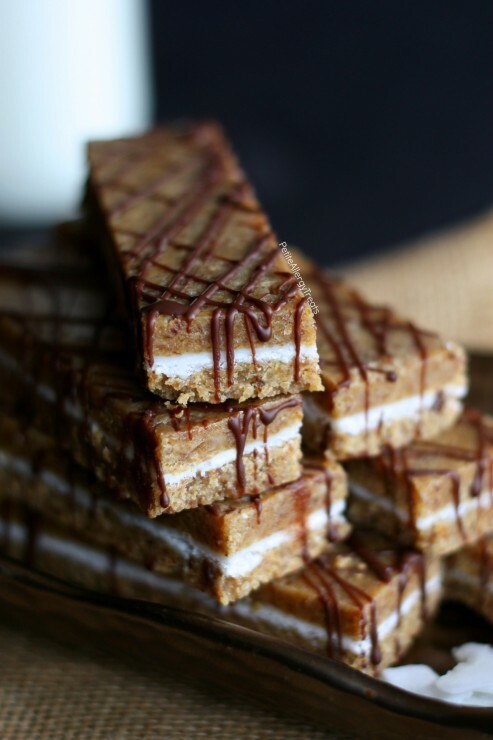 Break or chop chocolate bars into smaller bite size pieces. Bake at 350 for 12-13 minutes or when the center is still slightly soft. Remove cookies from oven. 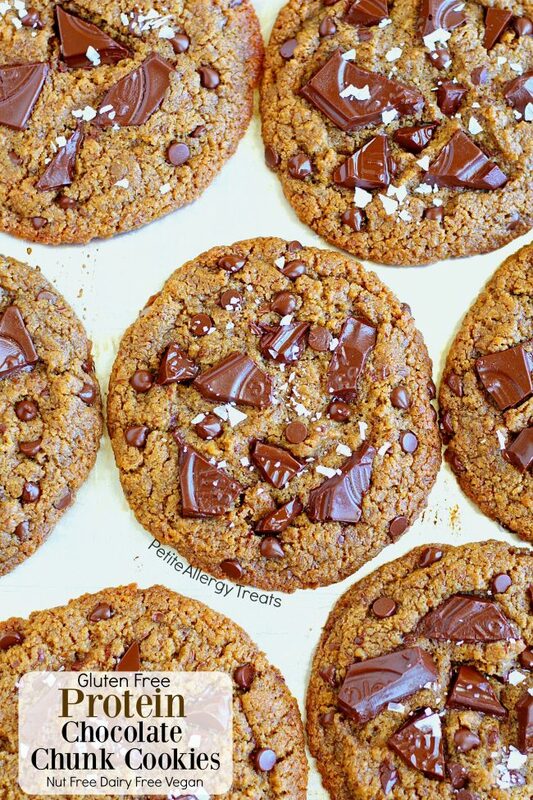 Immediately add more remaining chocolate chunks to cookies and allow cookies to fully cool before moving. Nut and seed butters absorb lots of moisture and can cause the dough to appear to be dry yet oily. This texture is normal due to the natural oils released from the seed butter. The dough will be too sticky when warm and therefore chilling is needed. 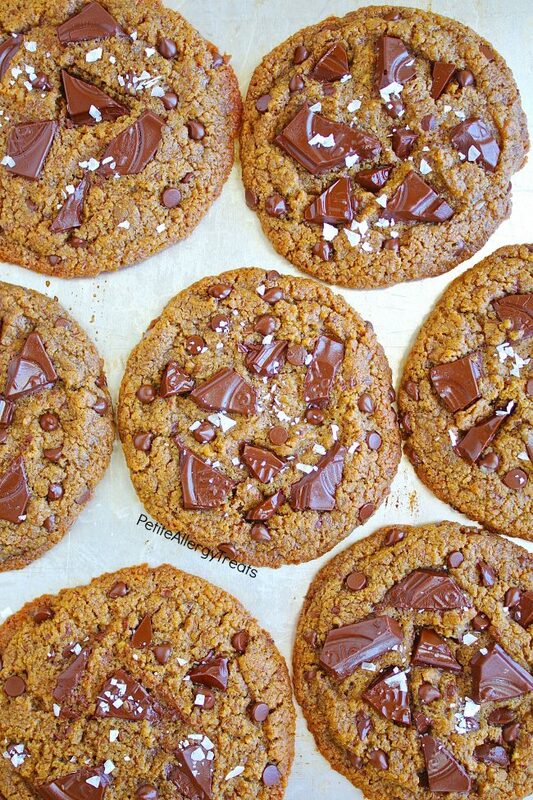 You can bake the cookies immediately (can't wait, right?) but it will affect the overall appearance and thickness. Keep the unused dough chilled while shaping. 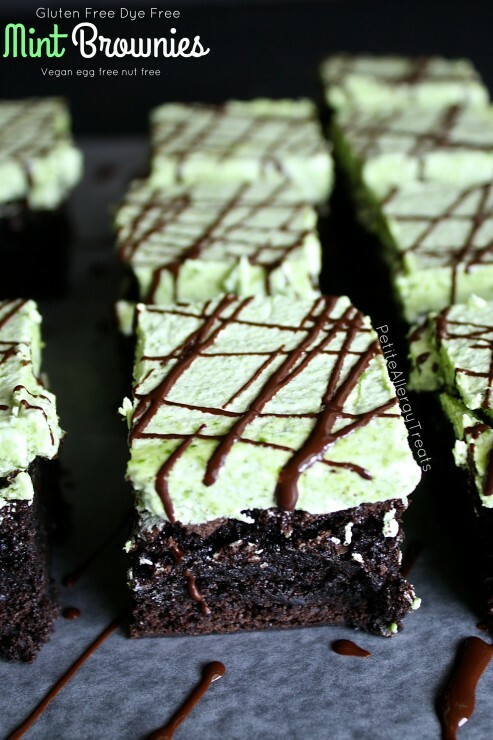 Green is still good...If you end up using sunflower butter it may or may not, turn slightly greenish after being baked or before if you do not bake them right away. It's from the reaction of the baking soda and natural chlorophyll in sunflower seeds. Still tastes normal. My dough turned green after sitting a day unbaked in the refrigerator. You made these just for me didn’t you! This summer want by so fast! Cannot believe everyone is already back in school! I love that these are vegan! They look delicious! I know, right?! Thanks so much Brandy! 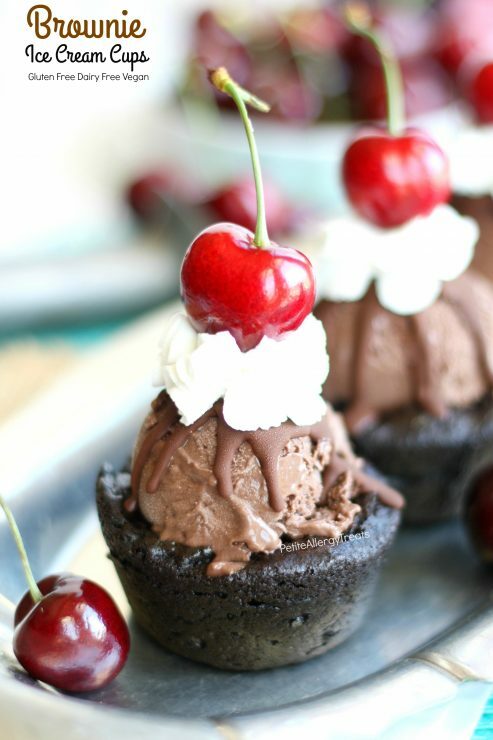 These look wonderful, and that chocolate — drool! 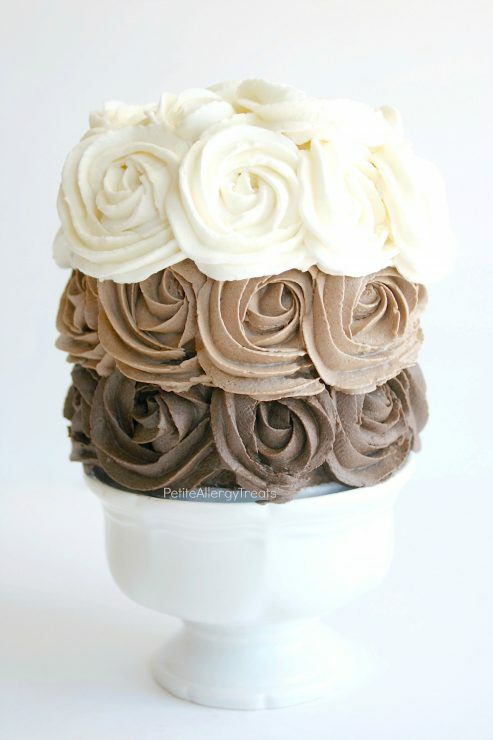 Everyone needs gooey chocolate in their life! Thanks so much Dee! What a super tasty protein packed cookie! Love this! A good reason to eat more cookies, right? Thanks so much Jessica! Lol! I firmly believe gooey chocolate can solve many problems. 😀 Thanks so much! I’m always looking for healthier after-school snacks – these look and sound perfect! 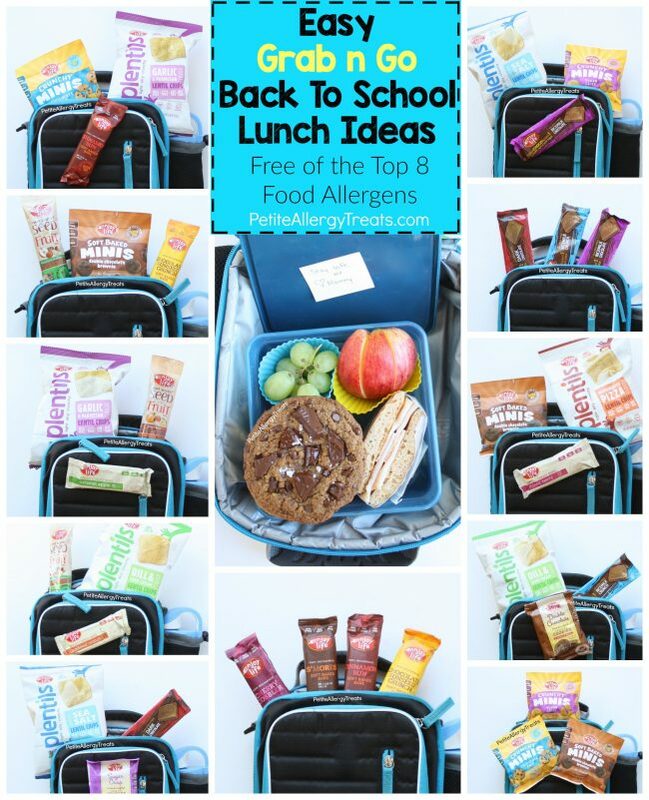 These would be great for after school, school lunches or school treats. Thanks so much Joanie! 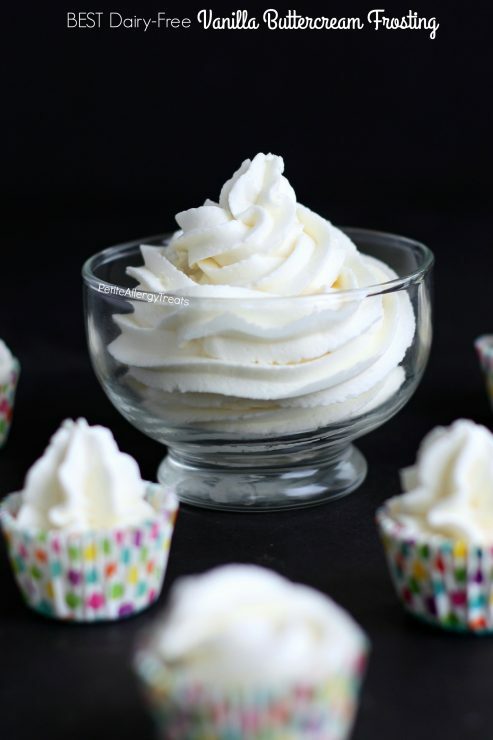 These look so terrific, even if you don’t have any food allergies at all! 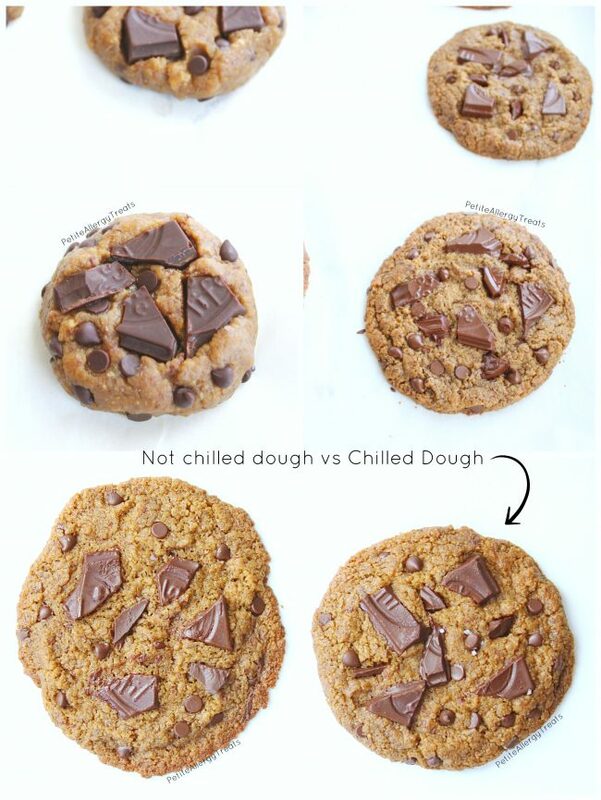 So much yumminess, and the graphic showing the difference between chilled and not chilled dough is a great visual! Super post, as always! I’m a visual learner and it’s so tempting to just bake them without waiting to chill. Thanks so much Shelley! Made the chocolate chunk protein cookies. Amazing. Turned out perfect.